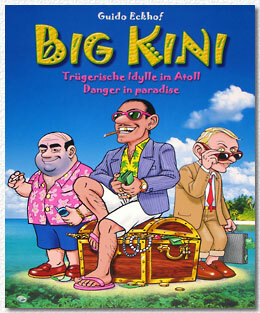 Big Kini (the title hints at "bikini's", the "bikini islands" but can also mean "The Big King", if you understand "Kini" in its Bavarian meaning - although Bavarians would stress that only Koenig Ludwig - the fairy tale king - was actually called "kini", but I digress…) plays on a yet uncharted island territory. The players try to conquer posts, milk the islands of their resources and to gain fame through discovery of new islands. The game ends when either all islands are explored or 12 rounds have passed. Most VP's win, as usual. 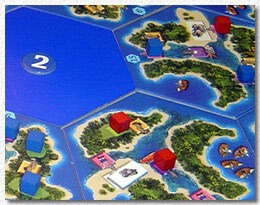 In typical Settler's style a modular board is built, consisting of hexes with three islands each. producing ships (or movement ability, the number of ships equalling movement points). Each player selects one of these hexes as starting space and places two pawns (or cubes in this case). All the hexes are different, and pay different starting money. On each hex are empty spaces which denote "posts". "Bay Baron" (controls all islands on a hex, worth a whopping 5 VP). discovery = move a cube with the movement ability and pay 5 money extra to reveal an undiscovered hex (2 VP for each hex that is such discovered). The "hitch" of the action board is as follows: if you are the FIRST player to use an action, you will be able to do it DOUBLE. This is extremely powerful, as you can create TWO new cubes, or have TWO factories produce money, etc. The second player to place the same action can only do it "normally", whereas the third player already has to pay two money to actually do a singular action. This means that your turn order will be extremely important for your tactical decisions this round. Sometimes you have to consider doing something that you rather wouldn't have done, or you will do a double action simply to deprive another player of doing the same! Voting the Bay Baron is a special process: You need the simple majority to vote one of your cubes into the post, but if you actually incite the action yourself you can win a tie. Some Bay Barons can also be bribed into their posts by paying resources of a certain type (which you have to spend). But triplets of three different resources also give 3 VP's at the end of the game, so you will consider if you want to actually spend them for political battles. How does it play? Big Kini belongs into the category of multi-player-solitaire games, as most of the time you will be content expanding your own empire. But the other players will constantly foil your plans by placing actions before you on the action board, so there is a constant influence in what players can do through the actions of the others. The conquest of new tiles at your doorstep or sending your cubes on the hexes of other players can seriously disrupt plans and further the development of others, so if you play with a more aggressive group this can even be a kind of wargame, with ministers and stewards battling it out for the coveted Bay Baron posts. Therefore one of the most important tips you have to give new players is: multiply, multiply, multiply, as having more cubes in play will give you more options. Rules: in English and German, no understanding of card or board text necessary, which makes the game perfectly easy to play for non-Germans. All symbols are very clear and don't need constant referring to the rule book. The lightly handled theme creates a fun atmosphere - the island setting is artificial (originally this was supposed to be a SF game, but these never sell well in the German market) but somehow fresh, and the humoristic drawings are actually quite cute and funny. I personally really like this game - it plays quickly, and can be taught quickly as well. It is certainly not above Settlers in its level of complexity, and so could be a good game to introduce new gamers to the finer arts of boardgaming while giving seasoned players a lot of food for thought without them feeling undernourished. If you don't trust my judgment alone: this was also the general feeling of gamers playing Big Kini at the Essen fair, as it was - together with the already much-talked-about Caylus - the "Best of Show" - game at the Fairplay booth. As there is momentarily a profusion of light "filler" games or heavier "gamer's games" (like Caylus) it is good to have a game of the "medium" category, which is so rarely present right now. PlayMe (originally a mail-order store for games) can be congratulated on giving Guido Eckhof a chance to develop this great new game and risking publishing it in an already crowded market. It certainly has made a good splash at Essen, and I'm sure it will continue so in the future.